Malcolm Turnbull was on the unofficial campaign trail on the Central Coast of NSW for the upcoming Liberal Party spill of positions being forecast to take place next Tuesday (10 February). It comes after a confrontation in a 'secret' meeting between Turnbull and Abbott in the Prime Minister's offices on Wednesday 4 February. Turnbull used a Politics in the Pub event at Wyong with Member for Dobell Karen McNamara, along with some strategic tweets in his travels, to show his leadership colours to his fellow MPs. But one media pack question after the event stood out and made clear Turnbull is willing to trade any credibility and integrity on climate action for a chance at the top job. A repost of my original article for Nofibs. Bridie Jabour (@bkjabour) for The Guardian reported in a live account on the Politics in the Pub event. Stopped by reporters afterwards outside the Dam Hotel in Wyong, Malcolm Turnbull ignored all questions, except one. That question was on whether he would bring back an emissions trading scheme. This is a touchy question as Labor's first go at an Emissions Trading Scheme played a big part in Turnbull's downfall as opposition leader. "We had a referendum on the emissions trading scheme in 2013 which was showed the resolve against it. It was then repealed and it was replaced by the direct action policy now some people have said ‘Malcolm doesn’t agree with the government’s [climate] policy and thinks it should be canned…you can’t change your policies every two years or every three years. "My view is we have the same targets, bipartisan targets, we’ve got a different mechanism. We’ve got to leave that as it is and as is consistent with our policy, in the event of there being a new global agreement we’ll review the existing policy. But the idea we would or should suddenly reinstate something we have abolished is ridiculous." So why did Turnbull choose to answer that particular question? To reassure his party room colleagues, many of them still clinging to climate denial despite report after report, that he wouldn't bring back the 'carbon tax' or an Emissions Trading Scheme. So we get a stylish Prime Minister at the cost of effective climate action, with Australia's laughable targets making us an international joke degrading our diplomatic and international political influence. Carbon pricing and climate change were way down the list of priorities why people voted out the Labor Government in 2013, and in fact at the time there was majority support for greater levels of climate action, and despite the 'axe the tax' campaign, more people supporting carbon pricing than opposed it. The disunity of Labor and economic fears (played upon by the Liberals) were far more prominent in why Labor were defeated at the polls. So Turnbull is all for sticking to the bi-partisan targets, which is good to see. 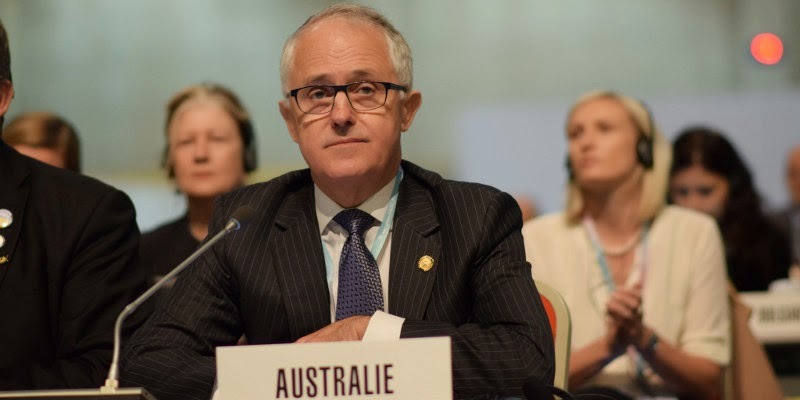 But he has not explained how Australia can scale up emission reduction to meet international commitments without an ETS or explicit market driven carbon pricing mechanism as part of the tools for taking effective climate action. The Climate Change Authority researched comparative international climate action and published a report on targets and progress in February 2014 recommending Australia lift it's target to 19 per cent emissions reductions by 2020 as our fair target when compared to the actions of other nations globally. It was met with silence from the Abbott Government, in denial that they had not been able to get legislation through the Senate to abolish the Authority. Just some background. Turnbull was defeated as opposition leader in 2009 after he had negotiated to pass Labor's Carbon Pollution Reduction Scheme (CPRS). He had extracted several concessions, with party agreement for bipartisan support for the bill. And then he faced a revolt and challenge in his own party room from those who were in climate denial. In the challenge Tony Abbott defeated Malcolm Turnbull by one vote to become Opposition Leader. Support for Labor's ETS was immediately reversed due to the ascendancy of climate denial in the Liberal Party. Labor's bill failed in the Senate as the Greens senators had not been included in the negotiations and were highly critical of several aspects of the scheme: they voted it down as poor legislation. "Because you have shown that you understand the science, you accept the science, and you’re alarmed about what the science is telling us. Yet for your own political purposes, for your own personal ambitions, for your own sense of individual achievement, glory, power and no doubt pay rise, you are willing to do deals with climate change deniers on the acceptance that you won’t, when in the most powerful job in this warming land, do anything about climate change. And that makes you the lowest of the low. That makes you worse than a denier. That makes you a grub. Please don’t think Australia isn’t going to notice." There has been no sign that under the Abbott Government Australia will lift itself from it's low 5 per cent target that Foreign Affairs Minister Julie Bishop presented to the UN Climate Summit at New York in September 2014, or the evasive answer she gave in January 2015 straight after President Obama's State of the Union address. The United Nations Framework Convention on Climate Change have called for new country targets (Intended Nationally Determined Contributions) to be submitted by the end of March 2015 for negotiations to proceed. Australia has so far remained silent on any changes to it's target. While the Queensland election was underway with Premier Campbell Newman and the one term Liberal National Party Government being given a lesson by electors, Malcolm Turnbull was in California inspecting the Tesla factory and came back raving about a test drive of the new Tesla Model S and the "energy revolution" involved. Meanwhile, investment in large scale renewable energy projects in Australia has effectively crashed due to the destabilizing of the Renewable Energy Target by the Warburton review which recommended slashing this target. Will climate change action be any better under Turnbull's leadership or any of the other Liberal contenders or are we about to witness a change in style, not substance? RT "@renew_economy: @TurnbullMalcolm raves about Tesla test drive. Hails "energy revolution" http://t.co/FVVY3QXkxK pic.twitter.com/BTqIzpQ0vE"